A stakeholder to the Dakota Access pipeline (DAPL) said he expects the controversial facility to start operating in the second quarter of 2017, despite the wave of protests and ongoing legal battles. The stakeholder, Phillips 66 CEO Greg Garland, made the comment during a conference call with analysts discussing quarterly earnings on Friday, which was later confirmed in a company press release. “Commercial operations are expected to begin in the second quarter of 2017, pending the issuance of an easement from the US Army Corps of Engineers to complete work beneath the Missouri River on DAPL,” the Phillips 66 press release stated, as cited by Reuters. Phillips 66 owns 25 percent of the $3.8 billion four-state pipeline project, expected to carry 470,000 barrels of crude oil per day from North Dakota's Bakken shale fields to Illinois. Led by Energy Transfer Partners (ETP) LP, DAPL was set to start operations by the end of 2016. 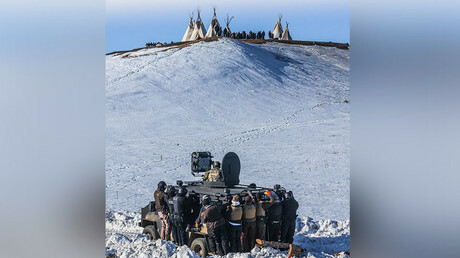 However, the project had to be stalled due to numerous protests and a legal challenge from environmentalists and Native Americans, led by the Standing Rock Sioux Tribe, whose land in North Dakota neighbors the pipeline route. The tribe opposes the construction of the final stretch of the pipeline under Lake Oahe, which they say is their principal water source and may be exposed to contamination. Former President Barack Obama in December was forced to block the final stretch of the DAPL from construction and order an environmental review of the site, after the protesters were joined by US military veterans, drawing even more public attention to the issue. The 1,172-mile pipeline was 93 percent complete by then. On January 24, however, just four days after he took office, newly-inaugurated President Donald Trump signed an executive order authorizing reconsideration of the December decision and promising to remove obstacles to the construction of the pipeline. According to White House spokesman Sean Spicer, Trump plans to discuss the terms and conditions of the construction with all parties involved, including the Native Americans, and to negotiate a deal that benefits everyone. At the moment, the Dakota Access pipeline is under US Army Corps of Engineers review. 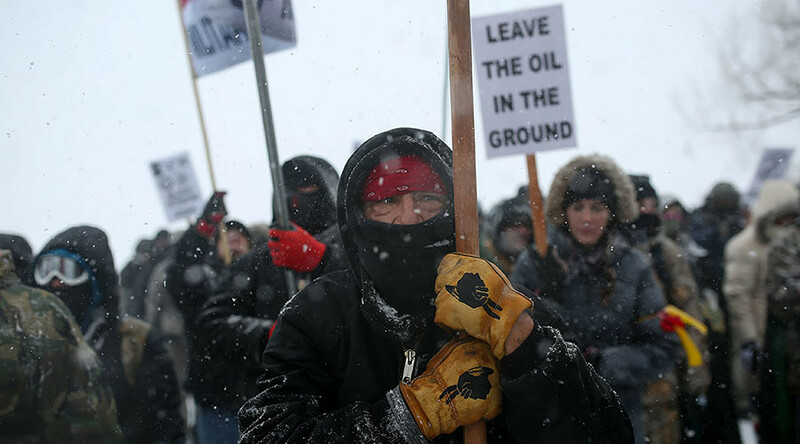 On Wednesday, the US Army said it had already taken steps to “expeditiously review requests for approvals to construct and operate” the pipeline, noting it expects to grant the DAPL its final easement within days. Still, the project's easement has not yet been approved, and it is therefore unclear whether the second-quarter timeline set by Phillips 66 will be met. Even if the easement from the Army Corps were granted immediately, the ETP has estimated it will need a 90-to-120-day drilling period before the pipeline can be put to work. Also, protesters are still occupying the construction site, where they have been for months now, at the so-called Oceti Sakowin campsite. The US Army Corps of Engineers has given them until February 22 to leave, according to ABC News. The Army also warned that the protesters’ campsite, which stands on federal property, may flood in the coming weeks, according to ABC News. Just two days ago, over 70 protesters were evicted and arrested after police raided yet another camp that sprang up near the DAPL construction site, claiming it was illegal. The new camp was erected on a hill Wednesday morning, a quarter of a mile from the original camp in the floodplain. 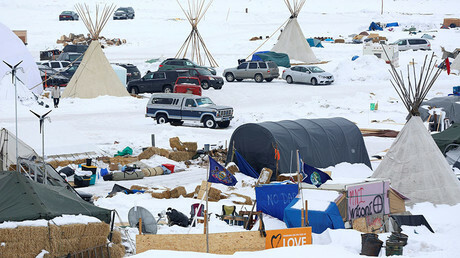 Seven tepee frames represented the seven tribes involved in the protest.